If lizards give you the creeps be grateful that you weren't with the first known human inhabitants of Australia who settled there 50,000 years ago. 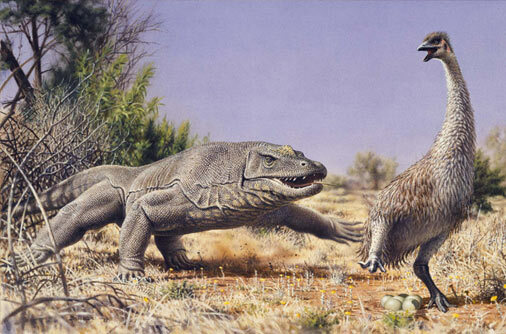 When they arrived on the vast but isolated continent they found that it was home to Megalania or the dust dragon, an enormous monitor lizard that could grow up to 26 feet in length, weigh in at 4,300 pounds, and had long knife-like teeth! Similar to the komodo dragon of Indonesia but much larger, the dust dragon was the largest land dwelling lizard ever and probably fed mostly on giant wombats, flightless birds, and kangaroos of the time. As if it's size and teeth weren't formidable enough it may have also come equipped with a powerful paralyzing venom it could inject when biting its prey. Because it was still around until 40,000 years ago it probably snacked on the occasional human being too!